Last night my sister gave birth to a little baby girl, called Lily (named after our grandmother). She is the first baby in our family, (apart from Maud of course who is a dogÂ and probably doesn’t really count)Â and needless to say we are all overjoyed. I started to think about decorating kids rooms and after a little bit of research found very little out there that appealed – most of the spaces felt somewhat how can I say, well twee. I think its important that kids rooms reflect the owners aesthetic especially whenÂ children are super young. Two women whom I greatly admire have done just that with their children’s rooms they are of course Jenna Lyons and Kelly Wearstler. 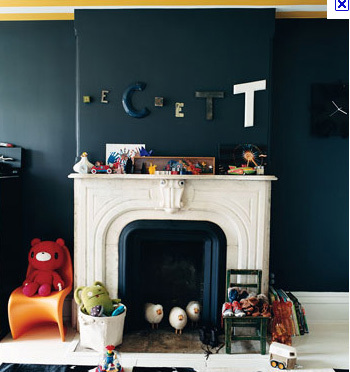 Below is the room belonging to Jenna’s son Beckett and whilst it follows the vibe of the rest of Jenna’s house it also feels wonderfully kiddy.The palette remains dark but is brightened with a fun striped ceiling, beautiful letters and lots of toys. If I had kids then this is how I want their bedroom to look! The other image I wanted to show you is of a fabulous room for Kelly Wearstler’s two boys. It still very much feels like a Wearstler interior, glam, grown up, playful but it has an energy to it that feels young. Now I just need to remember to dress like this when reading to Lilly! By the way we are looking for some interns to work with our marketing department particularly concentrating on our social media presence from mid May for about 6 toÂ 8 weeks. Ideally London based (for a few days a week would be spent at HQ) although thats not essential. If you know of anyone please let me know.